Sherwin Williams makes an exterior/interior bonding primer that I used the other day at m y own home in Laytonsville, Maryland to prime PVC. Being a very slick surface, PVC can be tricky to paint and have last a long time without peeling. As I was working with the Sherwin Williams bonding primer, I got a little on my hands. What a time I had trying to wash it off my hands after I had completed the work. Good thing I didn’t have the primer on my hands all day or it would have never come off! One thing this taught me is that this product is a superior bonding primer and since then I’ve used that same product at O’Connor’s Painting Service to not only prime PVC boards but also aluminum siding and any other slick surfaces. ← Old paint cans hanging about that you want to get rid of in a responsible manner? 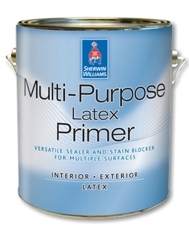 Couple questions – would you use this to prime stained cabinets? What grit sandpaper do you use to sand cabinets?